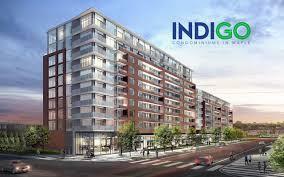 Indigo Condos Maple VIP Sale is Open Now!!! INDIGO Condos is amazing investment opportunity in Maple, Vaughan embody relaxation and rejuvenation, but excitement and adventure are nearby in the Village of Maple. INDIGO Condominiums will be an inspiration of beautiful architecture and thoughtful design, set in an unparalleled location for convenience. Situated adjacent to the Maple GO Station and minutes from Highway 400, 407 and HWY-401, five minutes from Vaughan future Subway and Vaughan new dowtown, the entire GTA is at your door. But, local amenities will tempt you to stay close to home. Enjoy parks, shopping and numerous dining options, right in your new neighbourhood. Get around comfortably and conveniently with your choice of transit. Located in the heart of the historic Village of Maple at Major Mackenzie Drive and Keele Street, the Maple GO Station is Ontario’s oldest operating railway station. INDIGO residents will be served by the GO Transit Barrie rail line, GO Transit buses, York Region Transit and the Toronto Transit Commission. Shop the day away at Vaughan Mills Mall where you can grab a bite to eat and explore a superb selection of stores and services. From interior décor stores to specialty food markets, the Village of Maple offers you a plethora of ways to spend your days. Go to Maple Station set up and GO anywhere in the GTA with easy access to the GO train at Maple Station. Ride in comfort to downtown Toronto in just half an hour. No need to worry about traffic congestion or parking, instead there’s time to catch up on reading or use the free WiFi to check your email. With numerous trains running daily, you’ll always have a way to arrive at your destination promptly. Comfortable and convenient, you will love having some quiet time for yourself knowing you can travel efficiently to all corners of the city and beyond. GO Transit is continuously expanding and improving, and will add 60 parking spots to the over 1,200 currently at the Maple Station lot in spring 2015. This amazing project cosist of 10 Storey Building and feature 256 mixed condo units. The Charisma Condos Vaughan Mills will open soon. Registration is open now for VIP Broker pricing and incentives. If interested Must Register using the attached form as soon as possible, in order to access prime units and platinum broker incentives, applications will be considered on first come first basis. For more information about building features, Floor Plans, and VIP Broker Price list Contact KALEEM @ 416-992-9860.